The numbers just prove that Dublin were as dominant as they looked to be in real-time. 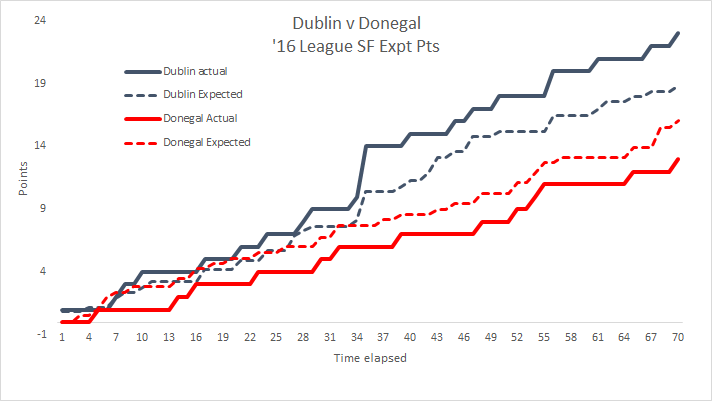 For the second game in a row Dublin’s shooting was below average, recording a Success Rate of 49%, but like in the Cork game that doesn’t really matter a damn if you can have 27 more shots than your opponent (it was 17 more shots in the Cork game). In last year’s Championship the highest number of attacking possessions was 49 for, coincidentally, Dublin against Westmeath. 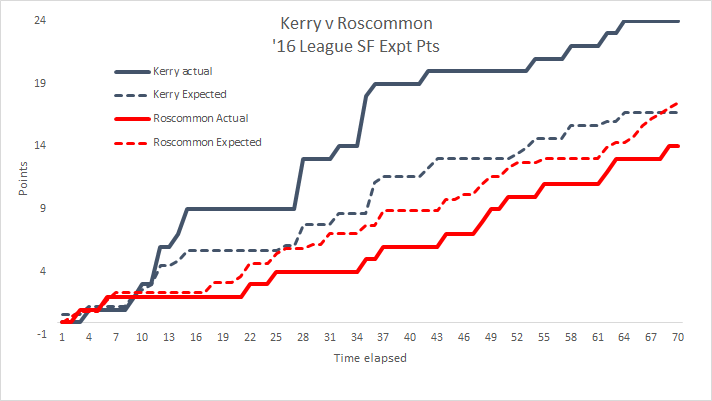 This is now the second game in a row where they have smashed through that with 57 possessions here and 54 against Cork. In both games their Shot Rate was in the low 80 percentile. 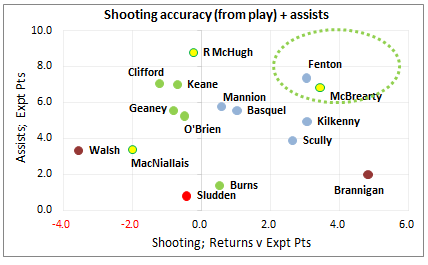 Dublin’s huge scoring is not down to their shooting prowess but rather the relentless nature of their attacking play. In the last two games they have overcome below average shooting with a phenomenal volume of shots. Again not much to be said here except to once again underline Dublin’s dominance. 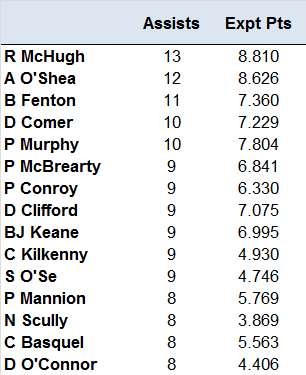 B Brogan & E O’Gara had as many shots from play (10 fro Brogan, 6 for O’Gara) as the entire Derry team. Once again Dublin were goal hungry. The percentages may not be as gaudy as the Tyrone game – where 40% of Dublin’s shots from play were shots at goal – but it did return a healthy 24% this time around. That’s 10 shots at goal in the one game. Converting three is about par for this team. Derry did have 6 goal attempts themselves getting 1-03 from those 6 shots but it was the 20th minute before they had an attempt for a point from play. Dublin had already taken 15 shots at that stage. The intensity was long gone from the game and this can be viewed by the fact that not one shot in the second half was from a dead ball. One of the weaknesses of the weighting is exposed here as although Lynch’s two attempts were from scorable sectors, (Sectors 4 & 6 respectively), both frees were more or less on the touchline. Not that it mattered but I thought it a strange decision from McIver to take off Heron just as they had received a free, in Sector 4, favouring his left foot. Take him off after the free? Or let Bradley, who took a subsequent free from the same side, take it? Yes it would have been Bradley’s first touch but would that have been any worse than asking Lynch to convert from the right sideline with his right foot? As I said not a decision of any great consequence but I just thought it odd. Dublin’s dominance was all encompassing. 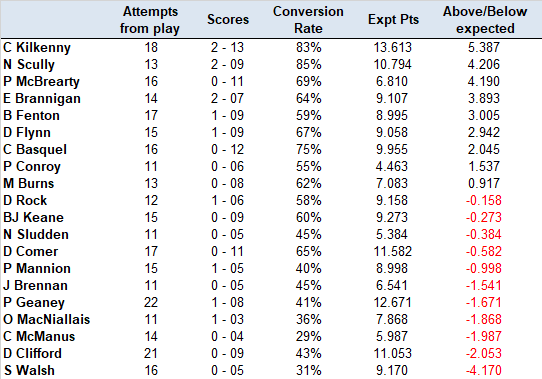 They had 14 kickouts and won all 14; we didn’t see where two landed (but given the flow of the game, and the time from the kickout, it was obvious that Dublin had garnered possession) and seven of the remaining twelve went short, so Dublin would be expected to win the majority but still; to gather all 14 is some accomplishment. For all the problems that they had Derry did ok on their own kickouts. 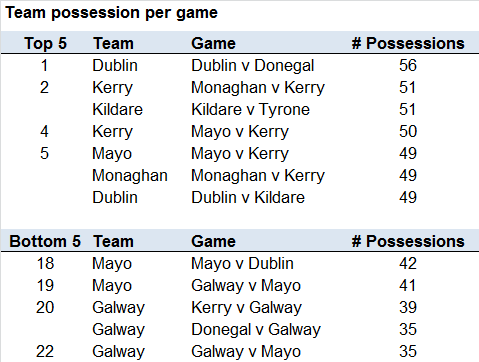 In total they had 38 but won possession on 63% of those (24 to Dublin’s 14). It was what happened next that hampered them – from the 24 that they won they only managed 11 shots from that possession; Dublin also managed 11 shots but from the relatively meagre 14 Derry kickouts that they won. 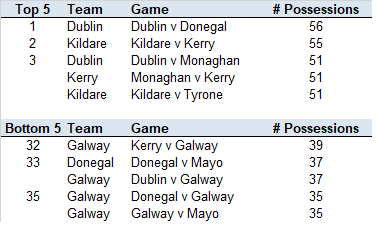 Of the 24 kickouts that Derry won only 6 were kicked short. Whereas Dublin kicked 7 short and managed to convert 6 into attacking possessions and three into shots Derry didn’t get one shot from their 6 short kickouts and only managed one attacking possession. Winning primary ball from their own kickouts was not the issue – it was the second phase and moving it through to Dublin’s 45 that stopped them in their tracks. After adding kickouts to the data last year the plan is to record turnovers this year. At a high level shots that go dead, either through going wide or being a score, will not be covered here as they are either covered in the shooting stats or the kickout stats (or both). Dublin had 32% more turnovers than Derry (33 to Derry’s 25) however it is what Dublin did with that turnover ball that is so striking. They managed to get a shot from 73% of those turnovers compared to just 36% from Derry. We have no reference points for either of these two numbers but the gap in returns would appear huge! 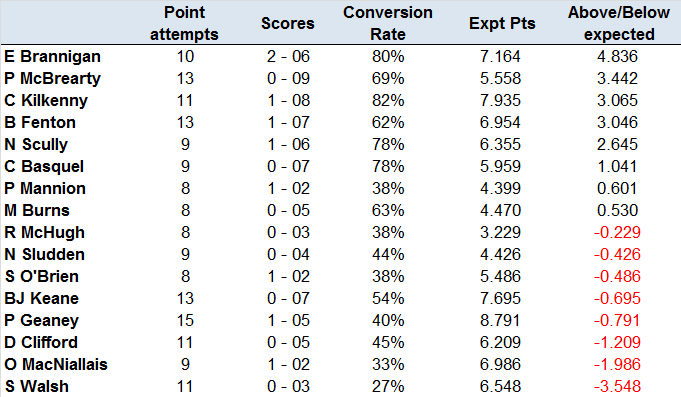 Dublin managed to score 1-09 from their 33 turnovers (30% conversion rate) whilst Derry scored 0-05 from their 25 (20% conversion rate). 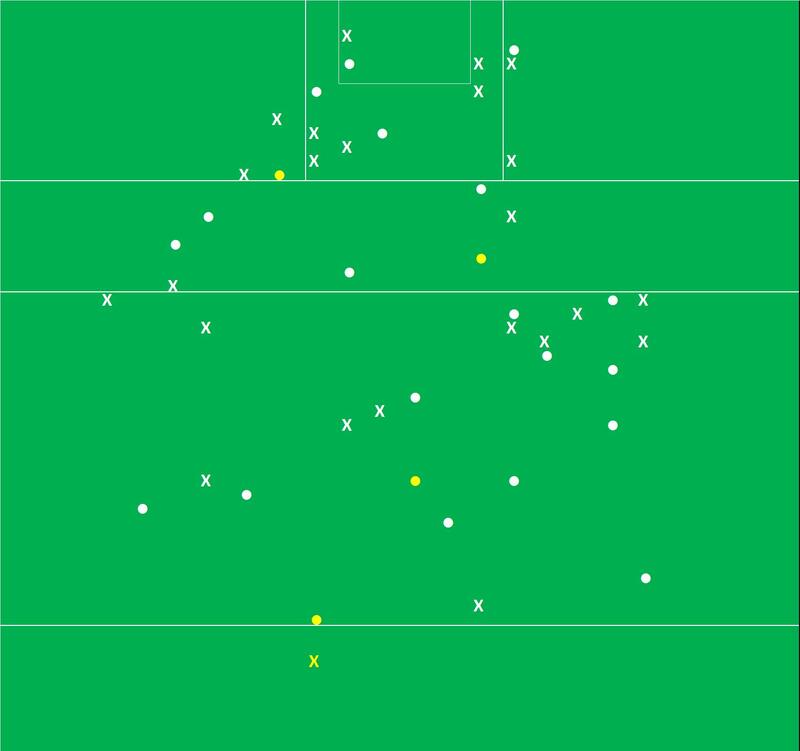 The spread of turnover types are very similar though Derry did misplace 5 more passes whilst also mishandling twice as many balls as Dublin (granted at very small volumes). B Brogan scored 1-06, which is an excellent return, but he took 13 shots to achieve it. His combined weighting for those 13 shots was -0.007 i.e. for the type of shots he undertook his returns were bang on average. 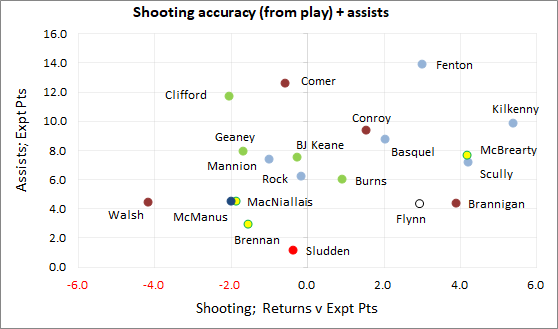 Flynn & Connolly had very good games with a combined 1-05 from 10 shots (60% Success Rate & a weighting of 1.592) whilst after a poor shooting performance against Cork ( 1 from 6) A Brogan pulled the horns in and chipped in with two points from two shots. A quick note for O’Kane who tried valiantly to raise the team from centre half back. He managed three shots with his only “miss” being a quick spectacular volley that ricocheted off a Dublin player standing on the line.